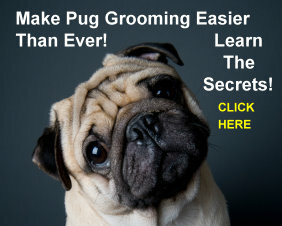 Living With A Pug and The Truth About Dog Shedding! Dog shedding is a problem. Let's face the facts. Although there is almost nothing cuter than a Pug, they are not perfect. Pugs are very cute. Pugs are extremely adorable. Pugs are a very friendly dog. They are playful and loyal and make great companions. They will do absolutely anything for you. They love to be around their owners. They just have one little chink in their armor: their problem is dog shedding – a common canine trait. 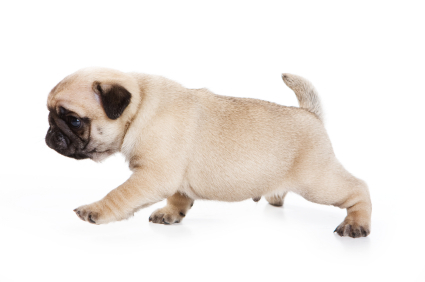 Pugs are cute and playful and like being part of all the activities in the house. One little quirk reported by many owners is that most Pugs are not particularly fond of vacuum cleaners. This is unfortunate because a vacuum cleaner is an absolute necessity. Plain and simple, this breed sheds. Pugs shed a lot so be prepared. When Pugs are the topic of conversation, dog shedding isn't far behind. You will want to consider dog shedding when you make up your list of grooming supplies. Having said that, they have a lot going for them. Pugs are a very friendly and lovable dog to have around the house. But they do require care and, as you’ll learn, this breed’s primary responsibility seems to be to provide companionship. They do that so well that the problem of dog shedding is often overlooked. Pugs are companions first! This definitely has implications. To leave this dog home alone is probably not fair to him and, if that is going to be the case, think about ways this can be handled. Can a friend or neighbor look in on them during the day? Can you come home during lunch? Puppies and senior pugs definitely need their potty breaks not to mention human interaction. Pugs function best with a schedule so that is something that also needs to be kept in mind. Regular times to eat, walk, play and nap all contribute to a happy dog. As mentioned in the section on health concerns, this little guy is prone to being overweight. For many, the recommended weight of 14 to 18 pounds seems very low and a pug at that weight looks a little “thin” at the middle. Since they love to eat, it’s easy to watch your little dog get past 20 or 22 pounds and not realize it. The best way to control their weight is daily exercise. It’s good for them and they love a good brisk walk. It doesn’t do the owner any harm either. And it allows them to “sneak” a few treats in during those long periods between meals. The best treat we’ve found, believe it or not, is a carrot! Of course, check with your vet to make sure they agree and also make sure your dog doesn’t have any reaction to them. But it’s rather comical to see how excited they get when you bring one out. We’ve found the baby carrots readily available in almost any supermarket work best. For special holidays they can get a full sized carrot which they will immediately run away with like a bone. Remember, check with your vet first!